Bernard Capes - The Black Reaper | Vault Of Evil: Brit Horror Pulp Plus! An Eddy On The Floor. Robert Aickman on Bernard Capes (1854-1918), as quoted in Hugh Lamb's introduction. One of the most interesting of the late-Victorian authors, unjustly neglected for decades until Hugh Lamb began resurrecting his work in the 'seventies. Capes didn't have anything published until he'd turned forty through a series of tragicomic mishaps - a failed stint as a rabbit breeder takes some doing - and the disappointment and anger at these personal disasters informs his best work. The worldview on offer in A Gallows Bird is one of gloating pessimism and, as Aickman points out, the stories often open with Capes getting what's been troubling him off his chest before they're allowed to continue. A Gallows Bird: Ducas poses as a swinging corpse to learn the location of hidden Carmelite treasure. While hanging, he witnesses the torture-murder of a fellow brigand by a priest and the 'junta of women.' He is also shot in the leg by a sadistic, corpse-kicking Holy man. A Queer Cicerone: The wicked Lord steps out of his portrait to lead the guided tours around the Somerset family castle, exposing their biographies as told in the guide book to be entirely fraudulent and each supposedly saintly member to be at least as unscrupulous as he. The Mask: Penn-Howard, author of Haunted Houses, a book of factual ghost stories, doesn't actually believe in the supernatural - until the affair in Hampshire involving the prematurely aged Mand Howick, a likeness of whom hangs in the family gallery. However, she is not the original, but the grand-daughter of the lady in the original, cursed by the twisted, unforgiving artist. The Sword Of Corporal Lacoste: Lacoste survives an avalanche in which his men are either killed outright or fatally injured. While he is unconscious, a gnome-like Priest and his dog-faced peasant accomplice rob the corpses and slit the throat of a survivor. Infuriated at having overlooked a potential victim, the Priest leads Lacoste to an inn where he is plied with food and drink and lets slip that he is carrying much gold coin. The barmaid tries to warn him of his peril but Lacoste allows the pair to lead him through the snow and back to his company. When they are attacked by a wolf pack, the peasant reveals himself to be not only a robber, but a lycanthrope! You can download a number of Capes' stories from Horrormasters, including The Mask, The Black Reaper, A Queer Cicerone and The Vanishing House though, sadly, no A Gallows Bird as yet. First encountered Bernard Capes in Hugh Lamb's Tales From a Gas-Lit Graveyard, which reprints both 'The Green Bottle' and 'An Eddy on the Floor'. Remember Lamb bigging him up as one of the great unremembered but neither story left any particular impression on me at the time. 'A Gallows Bird' sounds brilliant though and Aickman's "He also uses words in a curious way... as if he were writing under the influence of drink" comment is enough for me to want to read more. I could only find one Bernard Capes title which I can't see mentioned here. If you have Richard Dalby's Ghosts For Christmas, Capes' A Ghost-Child is in it. I ony rad his colection "At a winter's fire" ,because his evidently PD book "From door to door" isnt.Anyway,they should have put "Black Venn","The voice from the pit" and I dare say even "Dinah's Mammoth" in this colection.Im gonna do a full review of the first Capes colection too. Good news for you online shoppers. 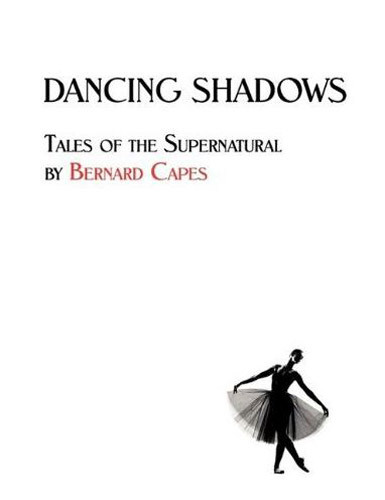 Coachwhip Publications have recently published two Bernard Capes paperback collections, the 400 page Dancing Shadows: Tales of the Supernatural and the companion Twists and Turns: Tales of Mystery, Adventure, Crime, and Humor. For those who've yet to sample the strange delights of Bernard Capes, his 1899 collection, At A Winter's Fire is available to read online at Hot Free Books. i've not yet found an additional lifetime to run through their entire catalogue but another to grab the eye is Robert Barr's collection of stories culled from the pages of The Strand, The English Illustrated Magazine, McClures & Co.,Revenge! (Chatto & Windus, 1896: subject matter self-explanatory). Hugh Lamb has revived several, most notably in the Equation Chiller three-author anthology Stories In The Dark, though he'd been drifting them into his collections long before. Also of note, In Court and Kampong - Being Tales and Sketches of Native Life in the Malay Peninsula (Grant Richards, 1897) which gave the world the story usually reprinted as The Ghoul, though here it features under it's original title, A Night Of Terror. Perhaps It's time to give Capes another chance. I did borrow The Black Reaper from the library once, but didn't really get on with his style, at the time. His fondness for local dialect can be frustrating, but he's is worth the effort. Here's a short, bizarre and surprising nasty sampler you might like to try to get acclimatised. it's one of Sydney Cowell's, a regular contributor to Pall Mall, Pearsons and similar late Victorian magazines, and rediscovering it has determined me to knuckle down to another outstanding project in the new year. Back in the 'nineties, there was a gent at the local flea market sold bound volumes of Victorian-Early Edwardian magazines for a few quid a time, so there's a random assortment mouldering on my racks, odd numbers from The Windsor, Pearsons, The Strand, Cassells, Harmsworths, English Illustrated Magazine, All The Year Round & Co. 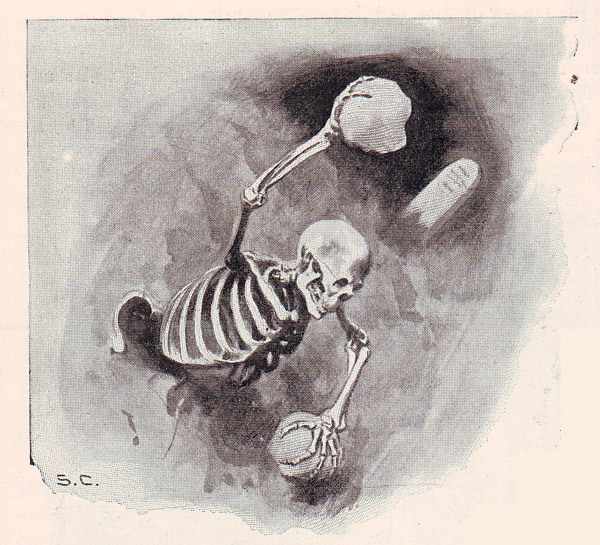 They're mostly the size of paving slabs, and i've never summoned sufficient resolve to index or even pick the juiciest bones from them, but what a treasure trove of macabre artwork and weird photography just waiting to be plundered! 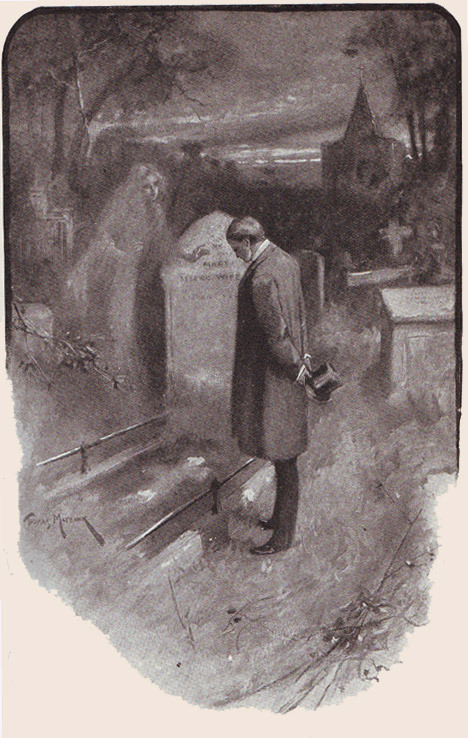 There are also several, mostly familiar ghosts and horror stories scattered throughout too, by the likes of Capes, Conan-Doyle, Erckmann-Chatrian, E. Nesbit, Mary Braddon, J. A. Barry, and Anonymous. Between them, Hugh Lamb and Richard Dalby have resurrected the very best in their anthologies, but there's sure to be a discarded scrap or two of interest. As a taster, here's a gorgeous Thomas Maybank illustration for E. F. Benson's compulsory-euthenasia-for-the-useless science fiction outing, The Superannuation Department AD 1945, from The Windsor Windsor Magazine January 1906. The skeletal postman/ skid row santa i used for your story Gift is another Maybank, lifted from the same source! Thanks, Dem, for pointing me at this thread. There's a lot to chew on here, so to speak. I believe that it is indeed The Black Reaper which is scheduled for digitized "Kindle" release this October, in Hugh Lamb's edition. Nice to see there are a couple of PDFs so I can get a preliminary sense of his work. 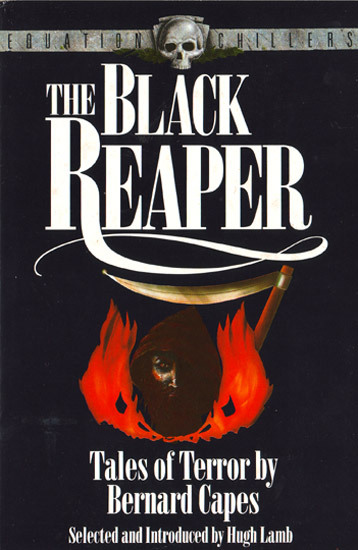 I have owned a copy of The Black Reaper for many years and have made several abortive attempts to read it. For some reason I find his style to be rather heavy going and I have been reduced to infrequent dips. Consequently, although I have probably read around half the stories I can remember little about any of them, the title tale being the one that I have retained the best. I went on a tiny binge several years ago but have since forgotten what prompted be to do so; I remember loving his style, it gave his stories a period flavour that is now well and truly extinct. It's a bit of a double-edged sword, however, as there is a bit of an obtuse quality to his plots, not in their comprehension, but in their reasoning. Contrast that with someone like E.F. Benson who doesn't really muck about. I think Capes is technically the better writer but wouldn't call him a better 'horror' writer. Of the three I read (I told you it was a 'tiny' binge) I'd say 'The Mask' was the better horror story while 'William Tyrwhitt’s “Copy”' had the best atmosphere, 'The Green Bottle' was good but was one of those quirky stories that end up being more novel than frightening.